Looking for an EPIC job? Epic Air is always accepting applications! Part time team members are require to be at least 16 years of age and have open weekend availability. Weekend availability is defined as Fridays 4:00pm - 11:00pm, Saturdays 8:00am - 11:00pm, and Sundays 10:00am - 9:00pm. Please note that you will not be scheduled for all of these hours. The typical shift is 4-6 hours and Epic Crew members generally work 1-3 shifts per weekend (6 - 18 total hours). On certain weeks we may have field trips or events during the day. Tuesday availability from 9am - 3pm and Friday from 9am - 3pm is a plus, but not required! Birthday Party Discounts for Your Family. 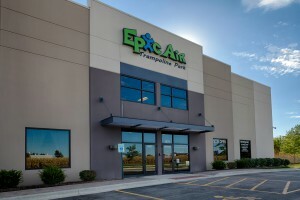 Check out this video our some of our team members versing our manager at trampoline dodgeball! - Ensure that party guests and parents have an EPIC time. - Serve pizza, drinks, and cake to Birthday Party. - Follow policies to ensure the Epic Air standard is upheld. - Greet guests and deliver five star guest service. - Use point of sale system at Front Desk and Concessions. - Multitask between assisting guests and completing assigned projects. - Keep guests safe by explaining and enforcing rules/policies. - Interact with guests to ensure they have an EPIC time. - Work as a team to ensure completion of cleaning tasks.